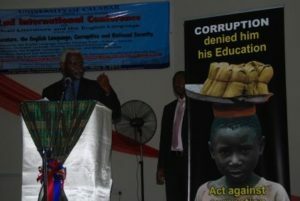 The Chairman of the Independent Corrupt Practices and Other Related Offences Commission (ICPC), Mr. Ekpo Nta, has advised the students and staff of universities in the country to eschew corruption in all its ramifications or be ready to face the wrath of the Commission. Mr. Nta gave this advice in an address he presented at the 22nd Annual International Conference on African Literature and English Language at the University of Calabar. Mr. Nta condemned the high rate of sexual harassment of both staff and students and warned that the excuse of ‘matured consent’ would no longer be acceptable in the new legal framework being crafted to address the problem. According to him, under no circumstances should a student be romantically involved with a lecturer. He said, “If you are in love with your lecturer, it’s better for you to save it till after your graduation, because mutual matured consent will no longer be tenable as defence for immoral behavior”. The ICPC Chairman also said that the universities would now be required to report to the ICPC students that they have punished for examination malpractice so that their records will be included in the Commission’s data base of offenders. He further revealed that the ICPC was investigating quite a number of university officials and students who had allegedly engaged in various corrupt acts and would soon be charged to court if they were found culpable. Mr. Nta told the audience that not reporting corruption is an offence punishable under the ICPC law and said that the ICPC has set up toll-free telephone lines to enable members of the public report acts of corruption to the Commission at no cost to themselves. The conference attracted literary writers from far and near including Elechi Amadi, the famous author of The Concubine and The Great Ponds.